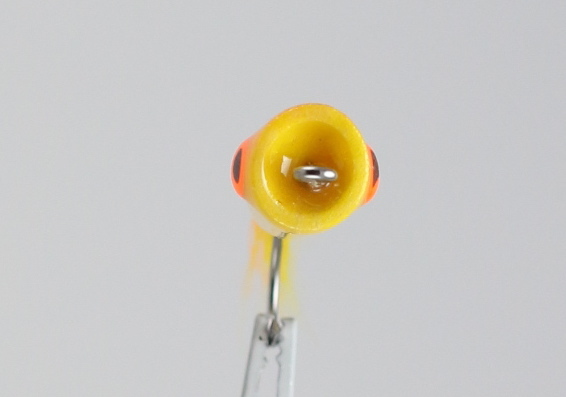 Pencil Poppers are very useful topwater flies for a range of saltwater fly fishing situations. With a slim profile, they cast more easily than larger designs, but still attract the attention of surface feeding fish like snook & tarpon, reds & seatrout, striped bass, bonito, and more. These are some of the nicest Pencil Poppers that we've ever offered here at Saltwaterflies.com. With a fine fishscale pattern, nice large eyes, and a glossy epoxy finish, you can be prepared for some truly explosive topwater action. These #1/0 Pencil Popper flies are approximately 3 1/4 inches long (8 cm). Tied by Rainy's Flies. Similar patterns: Bob's Banger, Bubble Head Popper, Crease Fly.